Melia Panama Canal is an exquisite hotel located on Gaton Lake in Colon, Panama that offers esteemed timeshare residence packages. Great for families and business travelers alike, the resort enjoys tropical surroundings that afford the best in outdoor entertainment. Zip-lining, kayaking, and water sports are examples of what the area has to offer, and the resort itself features tennis, basketball, and beach volleyball courts, as well as an outdoor swimming pool with a waterfall, massage services, a business center, and a kids' club. The comfortable suites include minibars, cable television, air conditioning and more. For more information about this stunning place of adventure, visit www.meliapanamacanal.com. 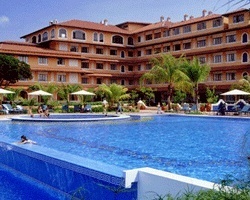 2 bedroom lockout suite in exotic Panama! RTU until 2034.